The Fire Temple of Isfahan is a Sassanid era archaeological complex located on a hill of the same name about eight kilometers west of city center of Isfahan, Iran. The hill, which rises about 210 meters above the surrounding plain, was previously called Maras or Marabin after a village near there, and it is by that name that the site is referred to by Arab historians. One part of the complex, on the southern flank of the hill, are the remains of a citadel of about twenty buildings (or rooms within buildings), many of which—particularly those in the lower half of cluster—are however only evident as foundation traces. Several buildings in the cluster have a classic char taq ―four arch‖ floor plan, characteristic of Zoroastrian firetemples of the 3rd century onwards and that are the actual atashgah that housed sacred fires. Other buildings include what may have been storage rooms and living quarters for priests and affluent pilgrims. A tentative identification of the purpose of the ruins was first made in 1937 by Andre Godard, but it was not until 1960, when architect Maxine Siroux made the first drawings, that the site could be properly studied. Godard‘s identifications were subsequently confirmed by Klaus Schippman in 1971. Another feature of the complex is the remains of a tower like circular building on the very top of the same hill. This structure, which was once at least twenty meters high, is known by the local populace as the BurjiGurban, or BurjiKurban, ―Tower of Sacrifice,‖ and appears to have been a military watchtower with a flare that could be lit to warn of an approaching enemy (i.e. a beacon). In both cases, the remaining walls are of baked brick, held together with a clay reed mixture. 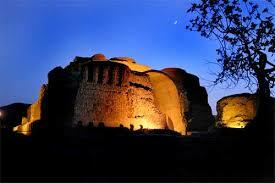 In the 10th century, the buildings were used by the Esmā‘ili inhabitants of Isfahan to hide from tax collectors. The Arab historian Masudi visited the site around the same time, and records local tradition as having believed that the site was converted from one of idol worship to one of fire by ―King Yustasf (i.e. Vishtaspa, the patron of Zoroaster) when he adopted the religion of the Magi. In 2002 archaeologist AlirezaJafariZand published a report on preIslamic Isfahan in which he emphasizes the religious role of the complex, and with reference to radiocarbon dating suggests that the construction was Elamite (pre6th century). A doctoral thesis suggests a ―similarity‖ between the tower and an edifice in Qom known as the Chahak fire temple; The similarity—so the author—being that the building in Qom has a cylindrical structure at the top while the tower in Isfahan is based on a circular plan.